The Fire and Rescue Service is to test the potential use of unmanned drones during large scale incidents such as flooding and gorse fires. An experiment will take place at Portrush Air Show this weekend. A formal agreement already exists between the fire service and Skywatch Civil Air Patrol for the call-out and use of their manned aircraft. The air show test could be the first step to extending the agreement to include the use of drones. Max Joyce, assistant group commander, of the Northern Ireland Fire and Rescue Service said: "The Portrush Air Show gives us a good opportunity to test the capability of using unmanned drones for aerial reconnaissance during large scale incidents. "For the first time ever we will be relaying live footage from the drones to our command support unit at the air show. "We know that using drones will enable fire officers to get an aerial view of operational incidents in real time thereby enhancing the safety and well being of our community and firefighters. "We are excited about the potential benefits this cutting edge technology could bring to quickly gathering information during large scale incidents - not only will it enhance interagency working, it will assist us greatly in emergency planning for these types of incidents and with our work in protecting our community." 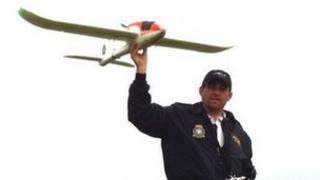 Last month, a small Skywatch drone aircraft was used in the search for a missing person on the coastline near Portrush. Dean Patton, 24, from Portrush has been missing since 24 July and the search was mounted at the request of his family.